Blues piano lessons have given influence to many different musical styles, like jazz, rock and country. If you learn blues piano lessons , you can easily transition to the other types of music. Blues piano has some rather basic conventions to follow, such as scale progressions, chord progressions and other chords. One of the most common blues chord progressions on the piano is the 12-bar blues, which often uses 7th chords. Chords are named by the intervals of notes that are used to play them. Chords are based on scales - the C chord, for example, is based on the root, third, fifth and octave. Every note in a scale is given a number or a Roman numeral from root, second, third to octave for intervals and I, II, II to VIII for Roman numerals. The Roman numeral I shows the first tone of any scale, for example C. The 7th chord for C would be I, III, V and VIIb, or C, E, G and Bb. Another common progression is I - IV - V, or C to F to G. Many basic blues songs are broken up into three-chord progressions in the interval described above. The first set of blues piano lessons would start you off playing I-I-I-I intervals on whatever scale you're using. The second set would be IV-IV-I-I, and the third set would be V-IV-I-I. Play these chords on your right hand, and remember to add the seventh interval to make it sound suitably bluesy. Now, it you're playing on the left hand, it's a rather simple eighth note pattern - I-III-V-VI-VIIb-VI-V-III. To make an example of this, if your basic chord is a C chord, your melody's notes will be C-E-G-A-Bb-A-G-E, and on an F chord (which is another common one) it would be F-A-C-D-Eb-D-C-A. The interval pattern described here is a very basic blues pattern. Blues also often uses something called pentatonic progression by playing the starting note, then the third, going up an interval, a third up from that and repeating by going up and down the pentatonic scale as desired. An example (one of my personal favorites) is B-D-E-G-A-Bb-A-G-E-D-C-D.
Another thing to remember is rhythm. Blues often contains somewhat of a slow swing rhythm like jazz piano , where eighth notes are clipped slightly shorter every other note to give a swing effect. Blues piano contains these very simple chord progressions and techniques to make blues piano lessons enjoyable. If you understand the techniques of interval shifting, chord changes and especially the pentatonic scale (and modifications of it) you can play blues piano quite easily. First, you should work on your 12-bar C-scale to get a feel for basic blues, then advance to other scales as you feel ready. Once you do this, you can practice rhythm and eventually learn to improvise your own blues songs. Running up and down the pentatonic scale is a good way to make a piano riff sound like the blues and impress your friends. Of course, learning actual blues songs wouldn't hurt either, but there's no rush; take all the time you need to learn the basics. Remember - once you figure out blues piano, you have a solid foundation for other styles of popular music. Before you dive into the beginner blues, checking out a few of our beginner web sites such as piano lessons for kids and piano lessons for adults may be extremely beneficial to you. As you continue to progress through the lessons you may want to check out a few more styles such as jazz piano . Also you can see how you can learn at home with online video lessons and how essential they are to your success as a pianist. 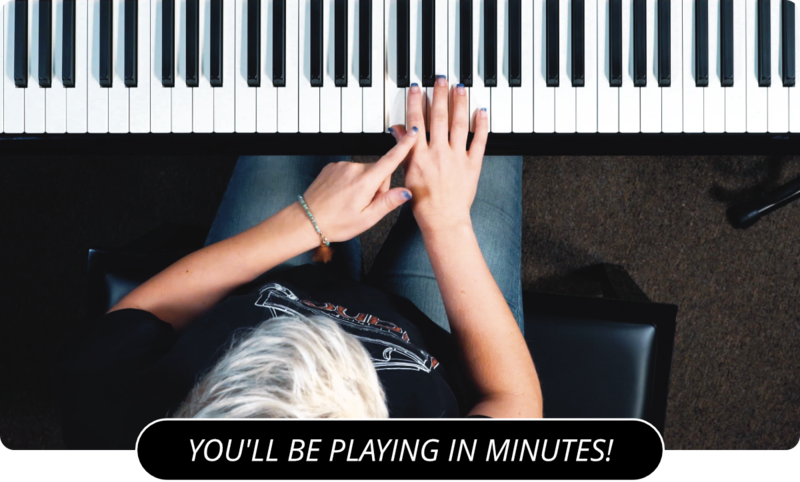 Learn more about blues piano lessons by visiting the main page of PianoLessons.com , or by reading through some of our other piano lesson articles that we've posted on this web site.